MCA cultivates and facilitates People-to-People (P2P) relationships that help build Trust. 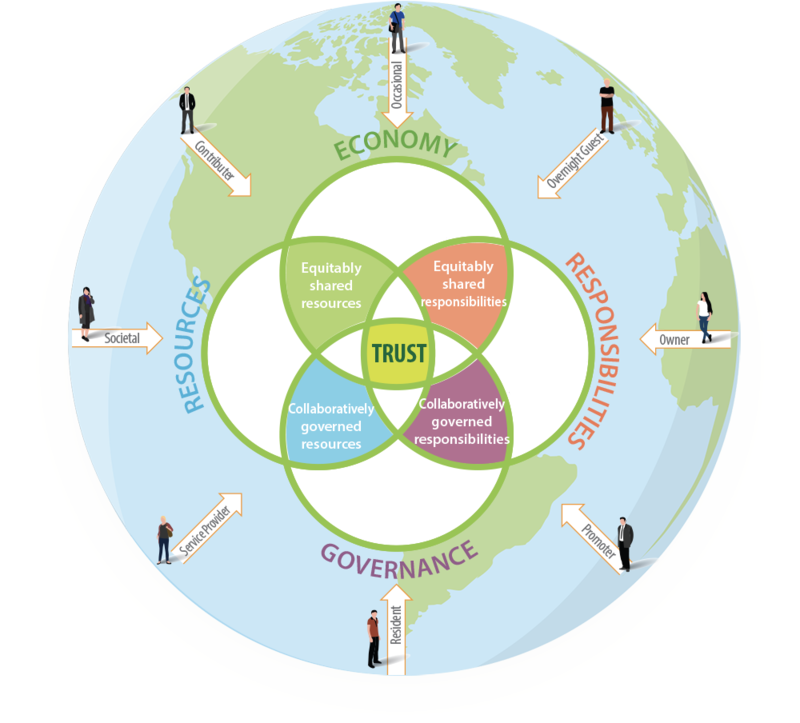 Lack of Trust fosters controversy, inequity, resource destruction and overall higher costs. MCA establishes a framework by promoting self-organizing, collaboratively-governed arrangements, sharing responsibilities and resources. By using Circles of Trust, MCA creates a foundation for true equity, resources are conserved, people feel connected to each other and their communities, resulting in overall cost reduction. Levels of Association identify a person's relationship to MCA, and the use of a customized toolset facilitates collaborative decision-making activities. • A means to connect autonomous, equitable, collaborative and shareable arrangements of any style and in any location. • A legal operating structure within which equitable, collaborative and shareable arrangements can be rooted. • A network of individuals who endeavor to build trust through shared experiences regardless of physical or financial constraints. • A toolset that facilitates ongoing collaborative decision-making. • A means of resolving the significant issues facing our society/humanity. • A set of ground rules; a structure for our chaotic selves. • Real people connecting with other people based on the principle of respect. • A market solution; we are a societal solution. • A pyramid scheme; our structure is non-hierarchical. • A service; participation comes with association. • Pretentious; individuality is encouraged. • Exclusive; the door to trust-building is open. • Rushed; good decisions take time. • Pressured; Associates and Circles are free to engage or disengage at will. A means to connect autonomous, equitable, collaborative and shareable arrangements of any style and in any location. This is a first-hand means by which entities exchange information and resources while building trust that is grounded in first-hand experiences. 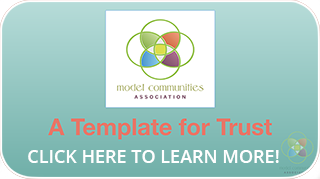 Model Communities Association (MCA) cultivates, fosters and facilitates equitable, shareable, collaboratively governed arrangements, studying their economic and social impact. We envision enlightened individuals living in conscious, independent, happy and healthy communities, exchanging resources within an optimized economic structure that addresses all the needs of those inhabiting this vibrant, diverse planet so that ample resources will be available to sustain current and future generations. MCA hopes to foster and facilitate arrangements that involve participation and collaboration. Using the MCA Theory, we intend to study how such arrangements impact all of us economically and societally. The organization formed is a Circle of Trust made up of individuals with shared intents and purposes. The standards and guidelines that become effective in the Model Community environment can be a stepping stone for similar endeavors. An informative dashboard area that offers easy access for users to utilize all the tools in the toolset. A unique virtual collaborative meeting tool allowing Circle Members to set agendas, record meeting results, distribute, archive meeting results, and more! This handy tool offers the ability for a group to discuss and consent (or refrain from consenting) online to a proposal, with results securely distributed and archived.